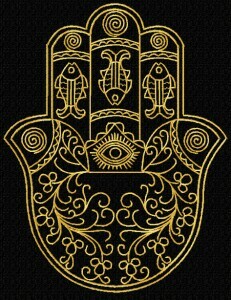 The Hamsa, also known as the Humes hand, the Hand of Fatima and the Hand of Miriam is a popular symbol found throughout the Middle East and northern Africa, particularly within the Islamic and Jewish faiths. It is one of the national symbols of Algeria and appears in its emblem. The first known use of the symbol can be traced to the civilization of Phoenicia that spread across the Mediterranean between 1550 – 330 BCE. The Phoenicians used an image of the hand to represent Tanit, patron goddess of their capital Carthage and controller of the lunar cycle. 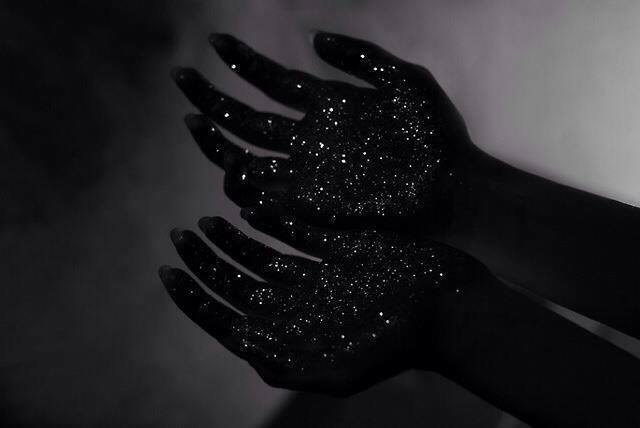 With time, her hand became a protective amulet in its own right and was used to ward off the evil eye, one of the oldest manifestations of human fear. The symbol was adopted by the ancient Sephardic Jewish community of the Iberian Peninsular, who named it the Hand of Miriam after the sister of the biblical Moses and Aaron and associated it with the number five (hamesh in Hebrew) to represent the five books of the Torah. It also symbolizes the fifth letter of the Hebrew alphabet, "Het", which represents one of God's holy names, and further reminds Jews to use their five senses when praising God. The Hamsa today is popular as a protective charm in both Middle Eastern and Western cultures, and can be found incorporated into jewelry, wall hangings, key chains and other decorative household elements.